↑ 3.0 3.1 3.2 Glantz 2010a, p. 20. ↑ 4.0 4.1 4.2 Liedtke 2016, p. 220. ↑ 5.0 5.1 5.2 Askey 2014, p. 80. ↑ Askey 2014, p. 80, ਜਿਸ ਵਿਚ 301 ਅਸਾਲਟ ਗੰਨਾਂ, 257 ਟੈਂਕ ਵਿਨਾਸ਼ਕ ਅਤੇ ਸਵੈ-ਚਾਲਤ ਗੰਨਾਂ, 1,055 ਬਖਤਰਬੰਦ ਅੱਧੇ-ਟਰੱਕ, 1,367 ਬਖਤਰਬੰਦ ਕਾਰਾਂ, 92 ਕੰਬੈਟ ਇੰਜੀਨੀਅਰ ਅਤੇ ਅਸਲਾ ਟ੍ਰਾਂਸਪੋਰਟ ਵਾਹਨ. ↑ Liedtke 2016, p. 220, of which 259 assault guns. ↑ Bergström 2007, p. 129. ↑ Mercatante 2012, p. 64. ↑ Clark 2012, p. 76. ↑ 18.0 18.1 Bergström 2007, p. 117. ↑ 19.0 19.1 Askey 2014, p. 185. ↑ Excludes an additional 395,799 who were deemed unfit for service due to non-combat causes, transported out of their Army Group sectors for treatment, and treated in divisional/local medical facilities. 98% of those 395,799 eventually returned to active duty service, usually after relatively short treatment, meaning about 8,000 became permanent losses. Askey 2014, p. 178. 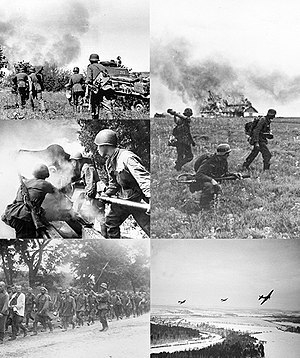 ↑ The four Soviet military districts facing the Axis, the Baltic Military District, the Western Special Military District, the Kiev Special Military District and the Odessa Military District, at the outbreak of the war were renamed the Northwestern Front, the Western Front, the Southwestern Front and the Southern Front, respectively. A fifth military district, the Leningrad military district, became the Northern Front. (Glantz 2012, pp. 11, 16, 208).